Exclusive 12, 8, 5 or 3 Easy Payments on QSC KS 212C 2 X 12 Inch 3600 Watt Active Cardioid Subwoofer only at AMS! Free 2 Day Shipping & Free Extended Warranty. Call our Gear Experts at 800-319-9043 for expert advice! A breakthrough in innovation and design, the KS212C subwoofer is the solution for highly portable entertainment and installation applications. The KS212C subwoofer represents the world’s first-in-class single-box powered cardioid subwoofer. The 3,600 Watt KS212C subwoofer uniquely provides all the benefits of cardioid deployment in a single, compact enclosure. 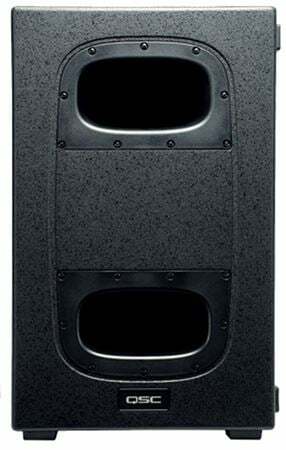 “Keeping bass in its place” for mobile entertainers, AV production and rental professionals, as well as modestly-sized performance venues, the KS212C subwoofer is unparalleled in its ability to manage low frequencies on the stage, or any application where undesirable low frequency energy needs to be minimized. Dimensions (HWD) inches: 24.5" × 15.5" × 33.5"
I started using QSC products last year when I purchase a pair of K12.2’s. The sound, reliability and overall product quality made me a believer. So I took the plunge and ordered a KS 112 just to try out, or so I thought. When the box arrived it seemed larger than expected. Upon further inspection I realized I accidentally purchased the KS 212C. My first thought was to send it back but curiosity just wouldn’t let me look at that box without opening it, so I did. Long story short QSC nailed it again! The sound that came from 2 12” woofers was amazing. The bass was tight with no distortion. Needless to say, the speaker will not be going back to the company I purchased it from. Great job QSC, keep producing great products. Great sounding speaker with good thump. XLR pins pulled out of back when I disconnected cable after a gig. Hope this was just a freak occurrence. I guess Ill find out about QSC and AMS warranty and customer services. Sounds great and well worth the money. This subwoofer comes ready to plug in an play. It has an easy to use LED screen in the back so even the most amateur person can set it up with no problem. If you want something that is easy to use, clear and powerful, and looks great, then this is your subwoofer! It’s worth the money to invest in. This sub is outstanding! It's very well constructed, and appears that it was designed for durability for mobile performers. Everything about this sub screams quality, from construct to sound. The 3600 watts of power is noticeably superior to other subwoofers in it's competitive market! I will definitely purchase a second unit to complete my QSC Set up! this sub is what the bass man ordered. i love it the lows are absolutely low and carries throughout the room. im anxiously saving money to purchase a second one to complete my collection of a QSC system im presently building. All expected results of a subwoofer this powerful! I purchased this QSC KS212C to connect my existing QSC sound system to add some of that much needed low end rumble for my bass pedals on the Nord C2D organ. It does just that and more. So much so, I can no longer imagine playing without it. I’ve traveled to several gigs with it. It’s portable, durable, easy setup... a little on the heavy side for lifting, but well worth it for the power it puts out. Take the plunge, you won’t be disappointed.